[Thursday, September 1, 2011] The human history of exploration and grand designs--from Ferdinand Magellan to John Harrison to Roald Amundsen--has been a history of patronage and persistence. [Thursday, September 1, 2011] The Innovative Partnership Program at NASA's Goddard Space Flight Center in Greenbelt, Md. is hosting an Emerging Commercial Suborbital Capabilities Vehicles Workshop at Goddard on Wednesday, Sept. 7, 2011, from 8 a.m. - 5 p.m. EDT. [Thursday, September 1, 2011] The child with the best drawing related to space or aeronautics in each Member State will have his or her name given to a satellite of the Galileo programme. 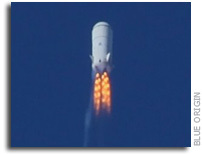 [Friday, September 2, 2011] Blue Origin lost one of its developmental test vehicles in an accident last week. Hints that something went wrong started to emerge when an FAA notification mysteriously disappeared with no word as to whether a test had or had not been accomplished. [Saturday, September 3, 2011] Researchers have created a new kind of cloaking material that can render objects invisible in the terahertz range. Though this can't translate into an invisibility cloak for the visible spectrum, it could have implications in communication. [Saturday, September 3, 2011] NASA's Office of the Chief Information Officer will host an agency town hall meeting at NASA Headquarters on Friday, September 16, from 1:00 - 2:30 PM EDT, to provide an update on the NASA I3P (IT Infrastructure Integration Program). [Sunday, September 4, 2011] The NASA Authorization Act of 2010 (P.L. 111-267) authorizes creation of a Commercial Reusable Suborbital Research (CRuSR) initiative within the NASA Office of the Chief Technologist (OCT). [Tuesday, September 6, 2011] Bobby Braun, who served as the first NASA chief technologist in a decade, will leave the agency in October to return to the faculty of the Georgia Institute of Technology in Atlanta. [Tuesday, September 6, 2011] NASA will hold a news conference at 9:30 a.m. EDT on Friday, Sept. 9, at the agency's Kennedy Space Center in Florida to discuss the organization that will manage the portion of the International Space Station operated as a U.S. national laboratory. [Wednesday, September 7, 2011] NASA should take steps to ensure that it maintains a highly trained astronaut corps to meet International Space Station (ISS) crew requirements while accounting for unexpected attrition or demands of other missions, says a new report by the NRC. [Wednesday, September 7, 2011] The "Industry Day" takes place from 9 a.m. - 6 p.m. (MDT) and is by invitation only. Interested suppliers should complete a registration form to express their desire in attending the event and becoming a Virgin Galactic and/or TSC supplier. [Thursday, September 8, 2011] Virgin Galactic is pleased to announce the appointment of former NASA, White House and Department of Energy official Steven J. Isakowitz as Executive Vice President and Chief Technology Officer. [Thursday, September 8, 2011] NASA has canceled the previously scheduled news conference on Friday, Sept. 9, about the award of the organization that will manage the portion of the International Space Station operated as a U.S. national laboratory. [Thursday, September 8, 2011] The New Mexico Spaceport Authority (NMSA) announced today that Enterprise Advisory Service, Inc. (EASI) has been awarded a contract to provide general services for Spaceport America. EASI has nine operating locations. [Thursday, September 8, 2011] The R&D 100 Awards announced annually by R&D Magazine will be presented during its banquet on October 13 at Renaissance Orlando at SeaWorld in Florida. [Friday, September 9, 2011] We have been working around the clock to not only create proposals for NASA's SBIR 2011, but to answer questions and work with other companies that are submitting proposals based on NanoRacks' facilities and standards. [Friday, September 9, 2011] Rather than announce these results and move forward with development, the administration's budget office has kept the independent cost report under wraps. »» XCOR Aerospace is now hiring! [Friday, September 9, 2011] Be a part of the NewSpace revolution and work closely with a small, dynamic team on spacecraft, rocket engines and other aerospace related projects. [Friday, September 9, 2011] NASA and Alliant Techsystems (ATK) managers will announce an agreement that could accelerate the availability of U.S. commercial crew transportation capabilities at 3 p.m. EDT on Tuesday, Sept. 13. [Friday, September 9, 2011] NASA has finalized a cooperative agreement with the Center for the Advancement of Science in Space (CASIS) to manage the portion of the International Space Station that operates as a U.S. national laboratory. 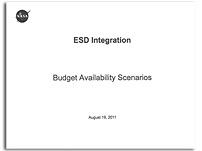 [Friday, September 9, 2011] This document covers four budgetary and Congressional scenarios whereby NASA would build the Space Launch System (SLS). [Friday, September 9, 2011] The NASA Authorization Act of 2010 (P.L. 111-267) authorizes creation of a Commercial Reusable Suborbital Research (CRuSR) initiative within the NASA Office of the Chief Technologist (OCT). [Saturday, September 10, 2011] Moon Express announced today that it has established the "Moon Express Robotics Lab for Innovation" (MERLIN) and has hired a team of the nations' brightest engineering students who became international superstars through the FIRST Robotics Competition. [Saturday, September 10, 2011] On Wednesday, 10 high-tech start-ups had the opportunity to present their business models to national financers at the Igniting Innovation Showcase, hosted by Space Florida and the Technological Research and Development Authority in Cape Canaveral. [Monday, September 12, 2011] NASA Inspector General Paul K. Martin today released a report that examined how well the Agency manages the $3 billion in grants its has awarded over the past 5 years to fund scientific research, scholarships, fellowships, and educational activities. [Monday, September 12, 2011] The Commercial Spaceflight Federation is pleased to support a letter on NASA Space Technology funding, signed by 45 companies, nonprofits, and research universities, which was delivered to Congress last week. [Monday, September 12, 2011] The National Aeronautics and Space Administration (NASA) will present a status of the Commercial Crew Program strategy on Friday, September 16, 2011. The Forum will be held at the Press Site at Kennedy Space Center from 11:00 a.m. to 12:00 p.m.
[Tuesday, September 13, 2011] NASA is offering undergraduate students the opportunity to test an experiment in microgravity as part of the agency's Reduced Gravity Education Flight Program. The program is accepting proposals for two different flight experiences in 2012. [Tuesday, September 13, 2011] NASA has selected five companies to develop concepts for demonstrating solar electric propulsion in space. These capabilities are important for the agency's future human exploration missions to deep space. [Tuesday, September 13, 2011] ATK and NASA announced a partnership today to work together during the development of ATK's commercial Liberty(TM) Launch System, an agreement that also supports the 2010 National Space Policy by furthering international partnerships. [Wednesday, September 14, 2011] WHO: NASA Administrator Charles Bolden and Members of Congress, including U.S. Sens. Kay Bailey Hutchison and Bill Nelson. WHEN:TODAY, Wednesday, Sept. 14, at 10 a.m.
[Wednesday, September 14, 2011] NASA leaders will participate in two media events Wednesday, Sept. 14, to discuss the new Space Launch System that will take American astronauts farther into space than ever before. [Wednesday, September 14, 2011] Today is a big day at NASA. The next chapter of America's space exploration story is being written, right here, right now. [Wednesday, September 14, 2011] NASA has selected the design of a new Space Launch System that will take the agency's astronauts farther into space than ever before, create high-quality jobs here at home, and provide the cornerstone for America's future human space exploration efforts. [Wednesday, September 14, 2011] NASA and the White House had originally planned to put off a decision on a heavy launch capability until 2015 or so - and then fully compete the selection process based on an architecture that would define what was needed and when. [Thursday, September 15, 2011] The N-Prize has been described as 'the world's smallest space programme'. Launched in 2008, the N-Prize sets the near-impossible challenge of launching and tracking a tiny orbital satellite on a shoestring budget. [Thursday, September 15, 2011] NASA's Commercial Crew Development Program is the most fiscally responsible means to rapidly advance human spaceflight. It has protected taxpayer dollars with fixed-price, pay-for-performance contracts. [Friday, September 16, 2011] Excalibur Almaz USA, a commercial aerospace company working to provide cargo and human transportation services, will showcase its space flown Reusable Return Vehicle (RRV) to area students on September 23 beginning at 8:30 a.m.
[Saturday, September 17, 2011] The selections are part of the agency's efforts to pursue revolutionary technology required for future missions, while proving the capabilities and lowering the cost of government and commercial space activities. [Saturday, September 17, 2011] With virtually no advance notice, the National Air and Space Museum's Udvar Hazy Center put a KH-9 "Hexagon" spy satellite on public display today. The display is up for one day only. Word of this display only leaked out late on Friday. [Monday, September 19, 2011] Space Expedition Curacao and XCOR Aerospace, Inc. jointly announced today the wet lease of production Lynx tail number two for operation on the Caribbean island of Curacao, pending export licensing action. [Monday, September 19, 2011] Commercial satellites are used by the U.S. government to provide a variety of fixed satellite services, such as military communications. However, the number of satellite operators providing such service has declined since 2000. [Monday, September 19, 2011] The Spaceship Company achieved a significant milestone in making commercial space travel a reality with today's opening of its Final Assembly, Integration and Test Hangar, or FAITH, at Mojave Air and Space Port. [Monday, September 19, 2011] NASA is releasing a Draft Request for Proposal (DRFP) for the Commercial Crew Integrated Design Contract (CCIDC). Previous releases regarding CCIDC were a Sources Sought Notice and Draft Requirements Documents. [Monday, September 19, 2011] NASA unveiled Monday an outline of its acquisition strategy to procure transportation services from private industry to carry U.S. astronauts to low Earth orbit and the International Space Station. [Monday, September 19, 2011] United Launch Alliance (ULA) announced today that Mark Bitterman has joined the company as the Vice President of Washington D.C. Operations. [Tuesday, September 20, 2011] With NASA's announcement of the new Deep Space Exploration System, attendance at this event will afford industry an opportunity to learn more about the new Heavy Lift Rocket that will one day take humans far beyond Earth. [Tuesday, September 20, 2011] NASA and the Comparative Aircraft Flight Efficiency (CAFE) Foundation of Santa Rosa, Calif., will hold the 2011 Green Flight Challenge, sponsored by Google, at the Charles M. Schulz Sonoma County Airport in Santa Rosa from Sept. 25 to Oct. 1. [Tuesday, September 20, 2011] Already engineered for use in applications ranging from desalination plants to treating non-potable water for backpackers, forward osmosis is the natural diffusion of water through a semi-permeable membrane. [Tuesday, September 20, 2011] NASA is announcing the International Space Apps Competition to support the Open Government Partnership (OGP), which President Barack Obama announced Tuesday. »» NASA ARC Solicitation: New Space Opportunities Blanket Purchase Agreement: Futron Corp.
[Wednesday, September 21, 2011] Description of the BPA requirement is as follows: To leverage global changes for NASA's benefit requires that NASA improve its ability to identify, analyze, and evaluate global space trends and new opportunities. [Wednesday, September 21, 2011] The ASTID program is an essential component in furthering NASA's astrobiology goals, and provides funding for new instruments that can be used in space missions as well as Earth-based research projects. [Wednesday, September 21, 2011] Liquid Robotics, an ocean data services provider and developer of the first wave-powered Wave Glider marine robot, today announced its Pacific Crossing (PacX) Challenge open to scientists around the world. [Wednesday, September 21, 2011] Bob Lipert held up a syringe, attached a plastic cartridge and demonstrated how chemistry developed at Iowa State University is helping astronauts and cosmonauts make sure they have safe drinking water at the International Space Station. [Wednesday, September 21, 2011] The clock is ticking for the first Soyuz flight from Europe's Spaceport in French Guiana. The rocket, which will carry the first two satellites of Europe's Galileo navigation system into orbit, is being prepared for launch on 20 October. [Wednesday, September 21, 2011] Last March, our organization put together a letter, signed by over 300 of America's brightest college students in space-related fields from over 35 universities, to express the opinion of college students on the future of U.S. human spaceflight. [Thursday, September 22, 2011] This evening, an Ariane 5 launcher lifted off from Europe's Spaceport in French Guiana on its mission to place two telecommunications satellites, Arabsat-5C and SES-2, into their planned transfer orbits. [Thursday, September 22, 2011] NASA this week completed the first in a series of flight-like parachute tests for the agency's Orion spacecraft. The drop tests at the U.S. Army's Yuma Proving Grounds in Arizona support the design and development of the Orion parachute assembly. [Thursday, September 22, 2011] NASA's Ames Research Center and the Department of Energy at the Lawrence Berkeley National Laboratory, Berkeley, Calif. are collaborating on technologies and processes for what may be the "greenest," highest-performing building in the federal government. [Friday, September 23, 2011] The Commercial Spaceflight Federation is pleased to announce that three companies providing services to the commercial spaceflight industry have joined the Federation as Associate Members: United Space Alliance, David Clark Company, and Moon Express. [Friday, September 23, 2011] The Senate Appropriations Committee has approved its version of the FY 2012 Commerce, Justice, and Science Appropriations Bill. This bill provides funding for the NSF, NIST, and NASA. [Friday, September 23, 2011] NASA has released the acquisition overview for the Space Launch System (SLS). SLS is an entirely new advanced, heavy-lift launch vehicle that will take the agency's astronauts farther into space than ever before. [Friday, September 23, 2011] NOAA is currently focusing on the October 2011 launch of the NPOESS Preparatory Project satellite--a demonstration satellite that the agency now plans to use operationally in order to minimize potential gaps in coverage. [Saturday, September 24, 2011] Payload integration has begun for the Intelsat 18 communications satellite at Baikonur Cosmodrome. The satellite will be launched on October by RSC-Energia-owned SeaLaunch on a Zenit-2SB launch vehicle. [Saturday, September 24, 2011] The Intelsat app provide satellite coverage maps for the entire Intelsat fleet, searchable by region, orbital location, or alphabetically, EIRP contours within graphical maps, Key satellite parameters and other information. [Saturday, September 24, 2011] The FAA AST proposes to issue an experimental permit to Space Exploration Technologies Corporation (SpaceX) to conduct suborbital launches and landings of the Grasshopper reusable launch vehicle (RLV) at the McGregor, Texas test site. [Monday, September 26, 2011] The activity estimated Falcon 9 would cost $3.977B based on NASA environment/culture. NAFCOM predicted $1.695B when all technical inputs were adjusted to a more commercial development approach. [Tuesday, September 27, 2011] Lockheed Martin has completed building the primary structure of NASA's MAVEN spacecraft at its Space Systems Company facility near Denver. [Wednesday, September 28, 2011] Cella's ground breaking technology could lead to lower priced fuel at the pumps, but moreover could improve energy security in the European Union, the United States and throughout NATO. [Wednesday, September 28, 2011] Four Brevard County-based economic development organizations have been awarded a total of $2.2 million in Federal grants to further develop a clean energy hub in Central Florida. [Wednesday, September 28, 2011] NASA /Marshall Space Flight Center (MSFC) has a requirement for large cryogenic Stages (Core Stage and Upper Stage) that are part of the Space Launch System (SLS) that will be capable of lifting 70 to 130 metric tons payload to a Low Earth Orbit (LEO). [Wednesday, September 28, 2011] NASA/Marshall Space Flight Center (MSFC) has a requirement for Space Launch System (SLS) Core Stage Engines. [Thursday, September 29, 2011] The competition attracted 13 teams, led by American innovators. Three of those teams successfully completed aircraft and flight qualification requirements are competing for the prize purse. [Thursday, September 29, 2011] The Navy's Tactical Satellite-IV (TacSat-4) successfully launched Sept. 27 aboard an Orbital Sciences Minotaur-IV+ launch vehicle from Alaska Aerospace Corporation's (AAC) Kodiak Launch Complex, Kodiak Island, Alaska. [Thursday, September 29, 2011] Satellites are helping to forecast the location of urban areas most affected during heat waves, helping planners to design cooler, more comfortable cities. [Friday, September 30, 2011] NASA leaders met Thursday to discuss acquisition plans for the agency's new heavy-lift rocket with hundreds of representatives of aerospace industry companies, small businesses and independent entrepreneurs. [Friday, September 30, 2011] Reusability is key to the dramatic cost savings that will enable advancements in human exploration of space. The Dragon spacecraft is fully reusable and SpaceX is working toward the goal of delivering the world's first fully reusable launch vehicle. 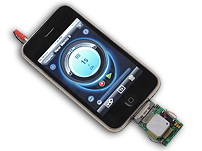 [Friday, September 30, 2011] NASA scientists are creating technology that can detect hazardous chemical compounds in the air with a smart phone.